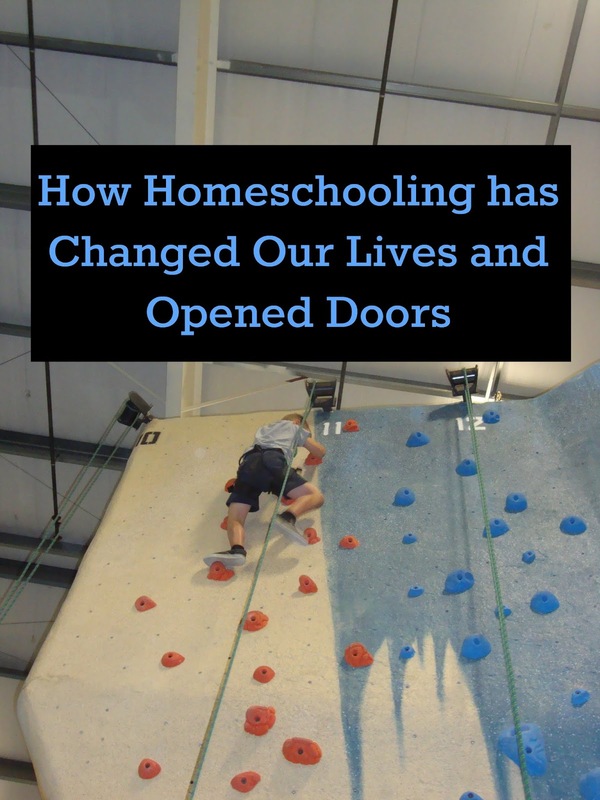 Homeschooling has changed our lives in more ways than I could ever have imagined. It has opened up so many doors for my family and has completely changed our lives. Through homeschooling we have had the time to really explore our world together. I was just marveling over this last night thinking about our awesome day of indoor rock climbing (something we probably would never have done if it wasn't for a homeschooler coordinating it for us!). Over the next month we have no less than a dozen homeschool activities planned; things from discounted movie days to gym days to park days and even Halloween parties. Most of our scheduled trips are with various groups and with each foray we met and make new friends and acquaintances. Most of our field trips are to places we've never been! So many places offer such tremendous discounts to homeschoolers that it's hard not to want to take advantage of them all. Many businesses, especially those that offer services to children, realize that their day hours are slow and poorly attended. They realize that they can make a smaller profit by catering to homeschoolers; many of which struggle to live on one income. These discounts make it possible for our children to experience a wide range of activities during school hours. We have taken discounted trampoline lessons, discounted karate classes, and gone to discounted movies just to name a few. As homeschooling keeps growing in popularity more and more business are offering services and group discounts. We so thoroughly enjoyed our day at Launch trampoline on Friday and marveled at the attendance level; there was a completely different group of homeschoolers there this time versus last time and yet there still quite a lot of people there. They added a basketball hoop since we last went! When we first discussed the possibility of homeschooling I never pictured our lives like this. I guess I thought we'd be home most of the time getting our schoolwork done waiting for the local public school kids to come home so we'd have someone to play with. I thought it would be just like school but at home. I even pictured us saying the pledge of allegiance, going over the calendar and following a school like routine. Of course, I was totally wrong and here we are just a few short years later and our day looks nothing like a pubic school day... and that's OK. I prefer for our days to look nothing like public school days. Our best days are typically those days where we get out of the house and explore a new place. Looking back, I never really imagined the sheer number of homeschoolers we would meet, the friendships we have made and the bonds we have forged with one another. I thought we were just changing where they learned, I had no idea we were changing our entire way of living. what times they should go to bed and what times they should get up. I felt like everything we did revolved around school and we adjusted ourselves and our schedules accordingly. The freedom we now have to chose our own schedules, foods and curriculum is amazing. As a family we are all so much happier and relaxed. I found that my relationship with the boys has grown by leaps and bounds, which I figured it would, but also my relationship with my husband has too and I never expected that! We've jokingly started referring to ourselves as annoying honeymooners and after 13 years of marriage that's really saying something! My kids have fallen in love with the library, with reading, and with books. I hate to admit it but I'm not sure we ever stopped by the library when the boys were in public school. We were always anxious to get home, get homework done, eat dinner and get ready for bed. That was our typically daily routine with a few sports practices at night thrown in making our afternoons more rushed, and me praying they wouldn't have much schoolwork that night. Now, we often stop by our library several times a week and walk out with a heaping bagful of books. Some days we just run in quickly to pick up our books that were on hold or to grab a particular book on CD or movie but other days we can spent an hour or more looking through the stacks of books. The stack of books they've read in just the past two days! I find my boys reading in bed when I go in to say goodnight to them and marvel over the stacks of books piling up by their beds-- those piles they want to read and those they have already read. Days when I feel guilty that they didn't read I often have to remind myself of all the "other" times they do read. I don't have to assign it as homework or as a school subject because they actually enjoy it. The only books they bring home from the library are books that THEY WANT to read. I don't tell them what to read or what to learn about; they have interests and passions and they know what they want to learn about. I help them find books they might enjoy but they know they are free to pick and chose. The freedom to chose is just as powerful to them as it is to me and they are reveling in their freedom. My kids have become so helpful around the house too. That's not to say they don't gripe and try not to do any chores (after all, they are still kids) but they know how to do so much more around the house now that I'm home with them and have the time to teach them. Just this week alone I found Ian cooking his own breakfast and putting all his pans and dishes in the dishwasher when he was done, I found Alec putting all of his laundry into the washing machine, and a few days later Ian also did his own laundry too! The boys all made their own breakfasts and lunches more days than not this week. The older two tried to branch out and make a few new foods too. Ian was afraid to use the pot holder to grip the shelf inside the oven and so we talked about kitchen safety and how to not get burned. I love watching them grow and develop real life skills. They are becoming more self- sufficient and as they successfully help in one area I push them to learn others. I often ask them to switch clothes from the washer to the dryer for me, they all help vacuum, dust, sweep, clean the bathrooms, and grocery shop too. I had all three boys helping to carry in all our bags of groceries this week too explaining that all jobs go quicker with more hands. I remind them that if they want my help than they must be willing to offer help. We work together as a team, more often than not and they're all learning that many hands make light work, that it's OK to ask for help, and most importantly, to be aware of when help is needed and lend a helping hand. The biggest change of all in our lives is our dinner routine. I have someone who sets the table for me. After I spoon serving sizes onto each plate they are all able to cut up their own food, get their own condiments and I get to eat a hot meal-- something I never thought would happen! Then one boy will clear the table, another washes the table and someone cleans the floor and counter tops. We rotate jobs every now and then so they can all develop equal skills and not get completely bored with their jobs. I can't say all of this is due to homeschooling since the boys are older and able to help out more but I do think they manage to do such great jobs with all the housework because I have time to teach them how to do it properly. We're all happy, smiling, connected and very close. A tight knit family learning together as we go through life experiencing new things together, meeting new people, and expanding our horizons.